Brown rice is taking over white rice these days due to its amazing health benefits. Brown rice has a low glycemic index which helps reduce insulin spikes. The side hulls and brans provide “natural wholeness” to the grains that are rich in proteins, thiamine, calcium, magnesium, fiber, and potassium. Here are some ways to spice up this super food. Add 3 slices of fresh ginger root to cooking water. Replace half of the cooking water with unsweetened coconut milk. Add ½ teaspoon dried or 2 to 3 teaspoons fresh herbs like oregano, thyme, and tarragon to the cooked rice. Add ½ cup currants or chopped apricots to cooked rice. Add ¼ cup sesame seeds with the raw rice and omit the salt. Cook rice in chicken or vegetable stock instead of plain water. Add fresh vegetables like capsicum to the cooked rice. Give it a tangy flavor by adding freshly squeezed lemon juice and coriander. Add whole spices while cooking like bay leaf, star anise, cardamom, and cinnamon. Sprinkle red pepper flakes and black pepper over cooked rice for a spicy twist. Add flavor by incorporating a vegetable soup mix to the cooking water. Add brown rice to Hummus for a texturized dip. 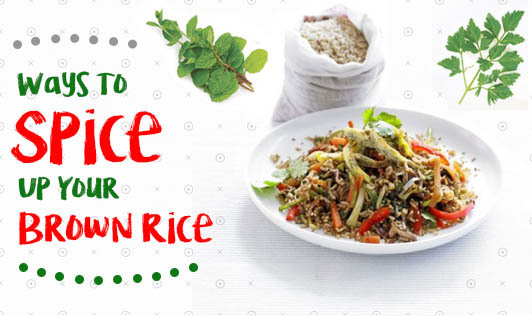 So now that you have innovative ways to spice up your brown rice, you can start adding it to your daily meals. You can experiment and decide which of these is your favorite way to enjoy this super food?